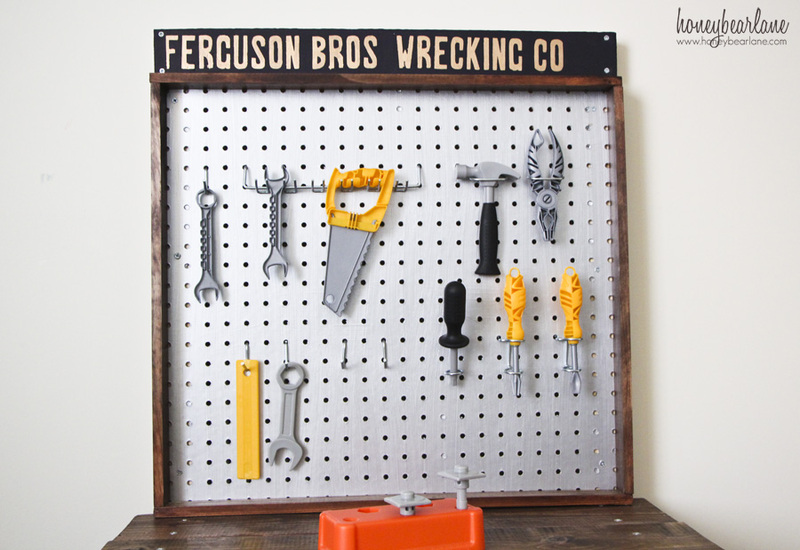 Remember that Craft Room Pegboard I made? I didn’t use the entire thing and so I had a cute idea on how to use some of the rest…a kids workbench! I think this turned out so cute. I was going for a Pottery Barn Kids effect rather than the primary-colors-and-plastic variety. And it was actually really easy. I completed this in an afternoon! 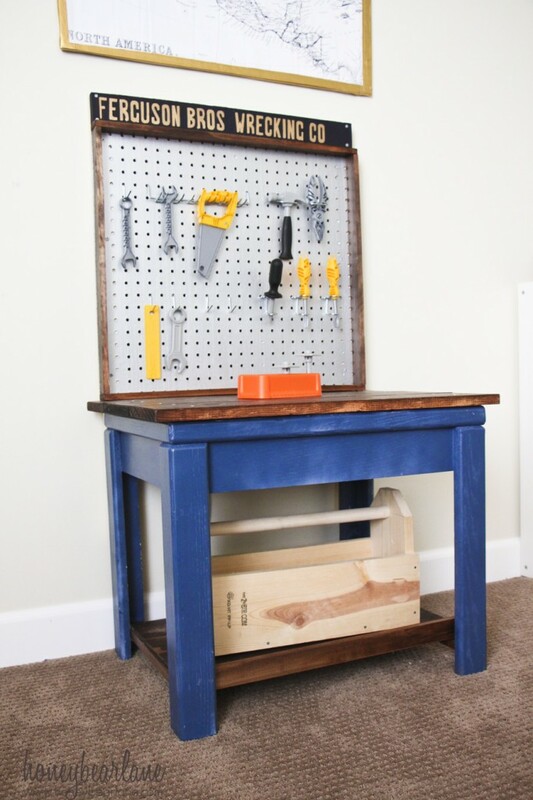 This kids workbench is built on one of those old ugly end tables that probably everyone had in the 90’s. I originally used it for a base of a train table for my boys but it turned out that they preferred building their tracks on the floor. So the table sat in the closet, taking up space. 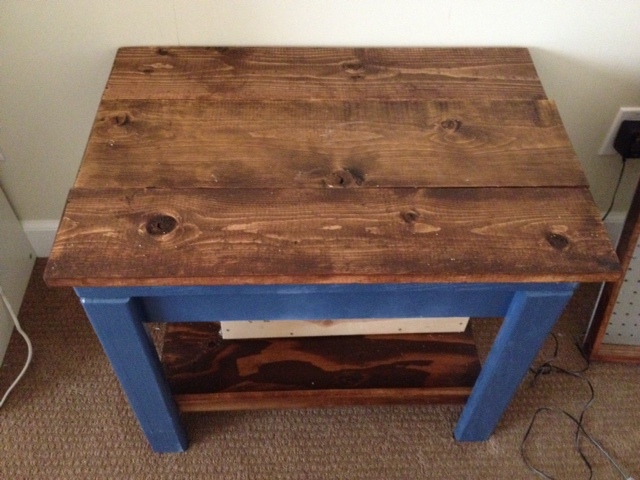 I knew I could give this sad table a new purpose in life by building a kids workbench on top of it. I had leftover pegboard hardware from my Craft Room Pegboard project so I just used that, but you can get the hardware pretty cheaply. I also found a lot of tools at Walmart for $10 but we had the IKEA ones too which I love. 1×6’s cut to the length of the table plus two inches (for overhang). You will have to determine how many you need to cover your table top width. Here’s what I started out with, before going to the store for the wood and hardware. I cut the pegboard to the size I wanted. It was smaller than the table, and in the instructions above I said you should cut it to the length of the table. Either way you choose to do it is not a big deal, it will still look good. After I got all the supplies and cut it to size, I stained it with a dark walnut color. 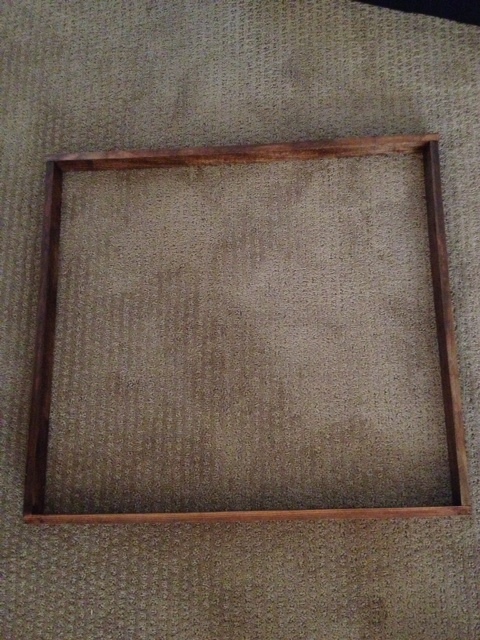 I then made the frame for the pegboard. This wood is 1/2 x 2, which after doing this, I wouldn’t recommend. It was difficult to put together without splitting the wood. I think 1×2’s would look great and be sturdier. If you have a Kreg Jig (which I didn’t at the time), you could put this together with pocket screws. 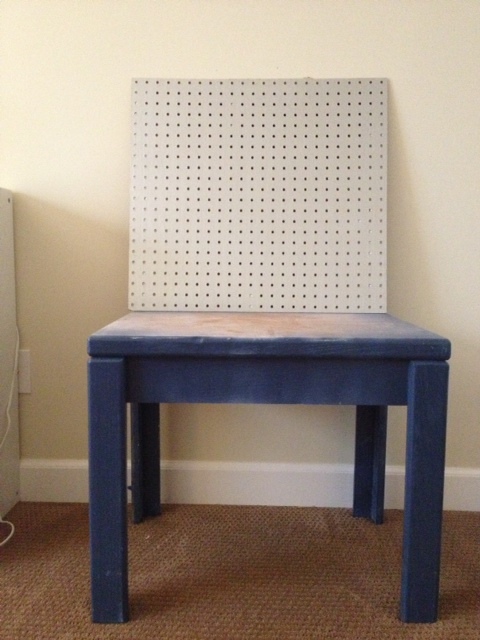 Then screw the pegboard (which I painted metallic silver–thank you Martha Stewart Metallic paint) straight to the frame, so it covers the entire back of the frame. For the tabletop, I actually tried to glue it down first and then screw it in place. But I am impatient and didn’t want to wait for the glue to dry. So if you are impatient like me, skip the glueing and you’ll be okay. If you are patient, I would glue and clamp it down for several hours and THEN screw in place. My impatience cost me and now my board are screwed on slightly crooked. But my 4-year-old was also helping me so I guess you just learn to love the imperfections. 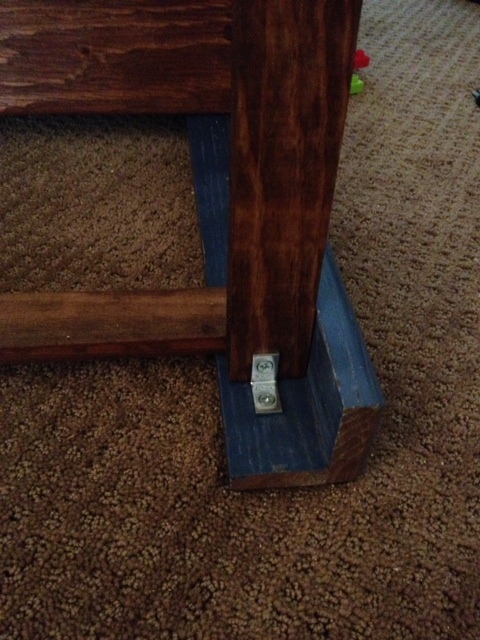 For the lower shelf, I used the brackets to secure the 1×2’s that go across the width of the table. Then I put my little plywood shelf on top (you could screw it in but I skipped that step since we don’t move this thing all the time.) I put the front face wood in front of the plywood (the 1/2×2). It was cut and fit so tightly I didn’t even need to secure it, but you could use glue and finish nails. 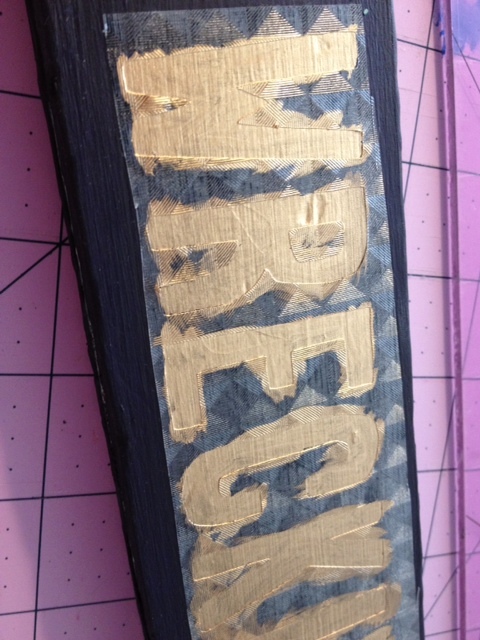 For the sign, I cut the words “Ferguson Bros. Wrecking Co” out with my Cricut. 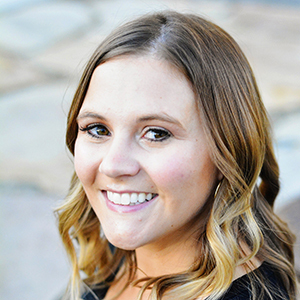 I loved this little name because that’s what my parents used to call my older brothers (Hansen Bros. Wrecking Company). I used the vinyl as a stencil and painted it on my 1×2 in gold leaf (Martha Stewart Brand–this stuff is GOLD, Jerry!) Literally, a tiny bit goes a long way. It is oil-based though, so wash your brush off with mineral spirits. To put the entire thing together, Stack everything up where you want it and first drill the holes through the 1×2’s and then the table legs. Use a long screw to secure this in two places. 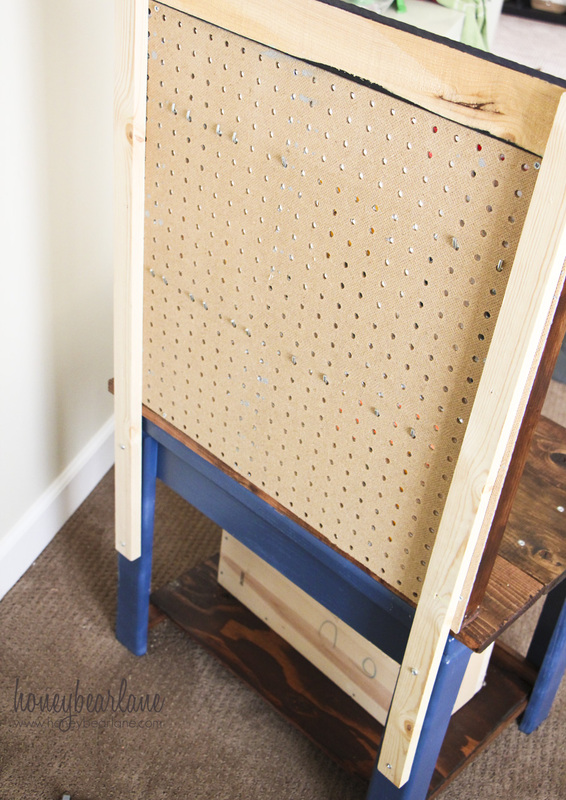 Then attach the pegboard by drilling the screws through the front of the pegboard to the wood in the back. Do the same for the sign on top. If you do this backwards (attaching the wood to the sign/pegboard first) you might find that the wood doesn’t line up with the table legs. I love how this project turned out. 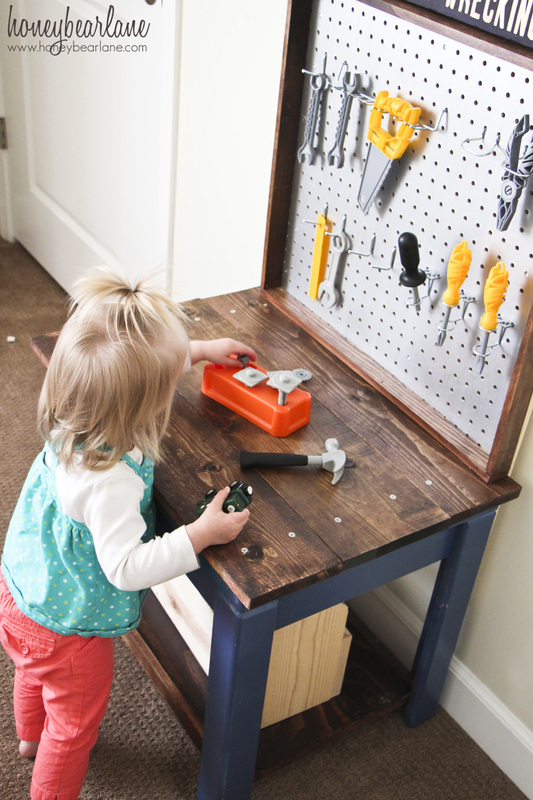 I didn’t mind that the screw heads showed, I think it adds to the whole kids workbench feel. My little boys love this, it makes them feel like a real handyman when they get to help me with my projects. Although I have to say, I think now that my 4-year-old has worked with real tools (with my supervision of course) the toys just don’t have the same impact. He truly is my son…sniff! 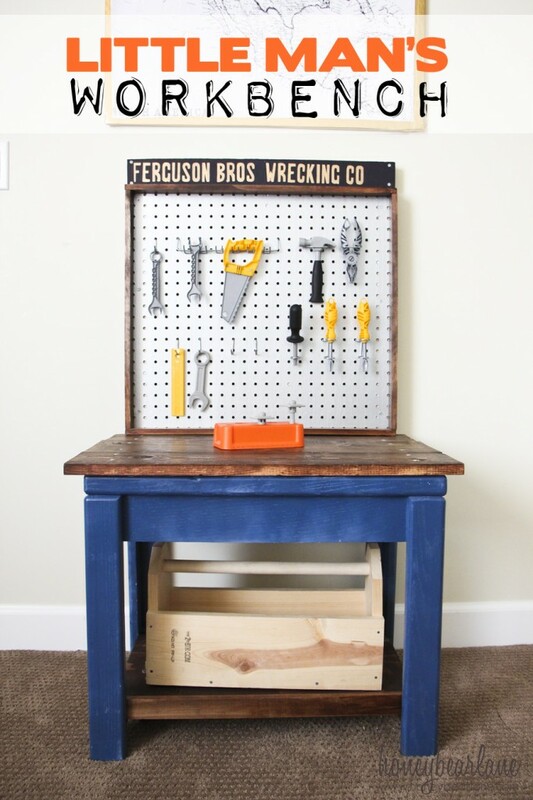 What weekend projects are you tackling tomorrow? Love this! My mini handyman is definitely getting one for his birthday! Thank you! He will love it!